As well as giving the world Leonard Cohen, Celine Dion and the faaaabulous Jay Manuel (America’s Next Top Model), Canada can lay claim to producing the world’s most dedicated professional darts player, a man who, according to his unofficial website, travels 140,000 miles a year ‘to quench his thirst for darts’. His name: John Part. Thirst is a recurring theme for Part, whose love of the booze is legendary on a circuit that prides itself on performing well despite utter inebriation. All those years on the liquor has left Part with an odd physical shape: regular looking from the front but with a gargantuan belly hidden beneath a sweaty black nylon darts shirt, the true scale of the beer baby revealed only in an expansive side profile shot. 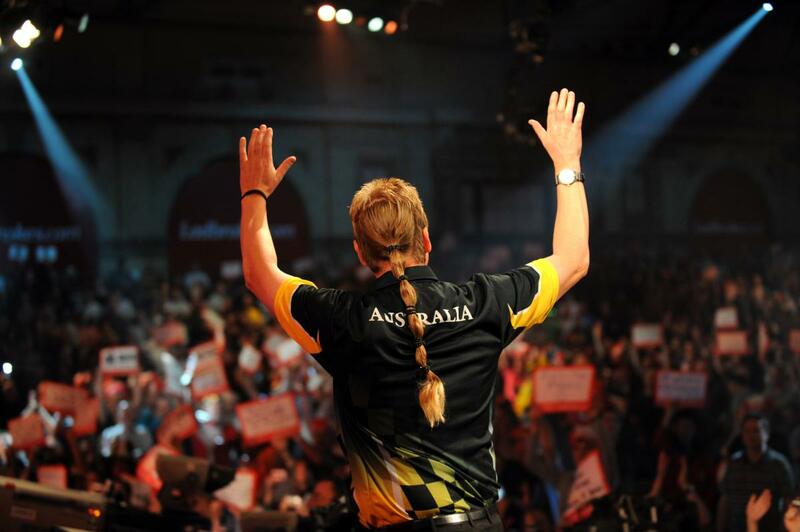 As a player, Part claimed the British Darts Organisation championship a solitary time prior to the revelatory player breakaway to form the Sky-backed PDC in 1997, whose title he won twice in 2003 (beating no less than Phil Taylor in the final) and in 2008. 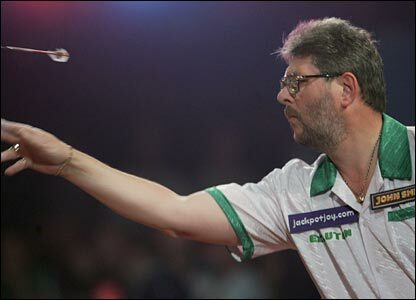 His style is one of the most fluent and pleasing on the circuit, the hand rocking back and forth several times like a nervous masturbator while his face grimaces as the dart is rapidly released towards the board. His greatest asset is an ability to hit ‘cover shots’ (moving down from treble 20 to treble 19) at will, a skill bettered only by Phil Taylor. Beyond the oche, Part is a regular in the commentary box, his smooth, concise observations a welcome respite from the gibberings of the neurotic Sid Waddell and the insufferable patter of Tony Green. An exquisite nine-darter can be found below. Poster boy for the Beeb’s cack-handed coverage of the second-rate world championship, the BDO, Wolfie is the darts player most familiar to Joe Public, his grizzled visage as integral to Auntie’s festive viewing schedule as Pat Butcher’s dripping mascara. In addition to the facial fuzz, the lesser-spotted Adams can be identified through his tinted aviator-style glasses, and the sight of his long-suffering wife, Sharon, clutching a toy wolf and screeching like a demented banshee at the Lakeside. While a class act with the arrows, Adams will never go down in the annals of darting folklore by virtue of his refusal to leave the cushy British Darts Organisation to join the big boys in the rival PDC, choosing instead to hoover-up worthless BDO titles year-by-year against mediocre opposition. Wolfie’s other notable accolades include the Peterborough Telegraph Sports Personality of the year 22007 – 2011, and patron of the UK Wolf Conservation Trust. I’m sure the wolves appreciate his support in these difficult times. While I may mock Wolfie and his unwillingness to play against the best week-in-week-out, his crystal clear life philosophy cannot be questioned: “People ask why I still play for a pub team. Well, it’s where I started and it’s where I shall finish, so why not continue playing in the pub in between as well? I love it. No pressure, no hassle. Just a good night out with good company, good beer and a game of darts.” Good beer and a game of darts. Amen. 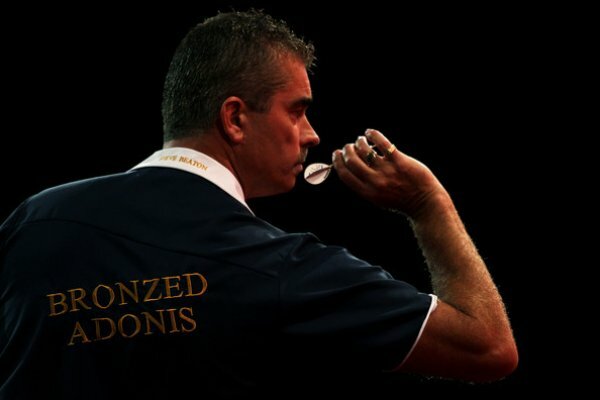 Of all the presents I have received down the years, perhaps my favourite was an unexpected parcel enclosing a signed picture of Steve Beaton, and some Steve Beaton darts flights. To my fiancé’s obvious displeasure, I proceeded to frame the Beaton picture and place it above the toilet, where it remains to this day. Few things stir the blood in the morning more than the sight of Beaton’s pristine mullet when taking a slash. Since his spell in hospital, Fordham suffered the indignation of appearing on Celebrity Fit Club with rent-a-celeb, Paul Ross, and a bunch of washed up jokers from Corrie. Whether he shat himself at the fear of living in such company, or actually undertook some physical exercise, Fordham managed to lose 3 stone, which, proportionate to his body size, was akin to having a haircut. 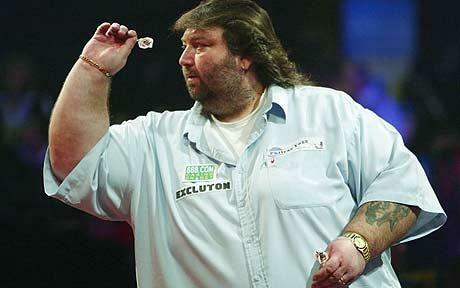 He returned to darts in 2007 following a self-imposed spell in the wilderness, during which he lost a further seven stone. The returning Fordham is a sight to behold: the head, as small as a pin, while the remainder of the body remains majestic in its scope. 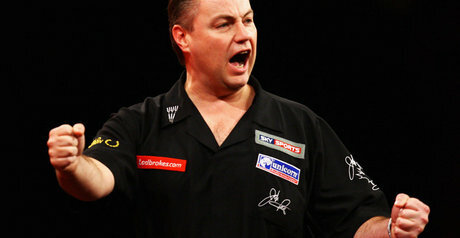 However while his health has improved, his darts has suffered, with the weight loss affecting his balance, causing him to relearn his technique. Fingers crossed the Viking can get back to former glories, if only to stick two fingers up at the ghastly, patronising Kay Burley. See interview below. 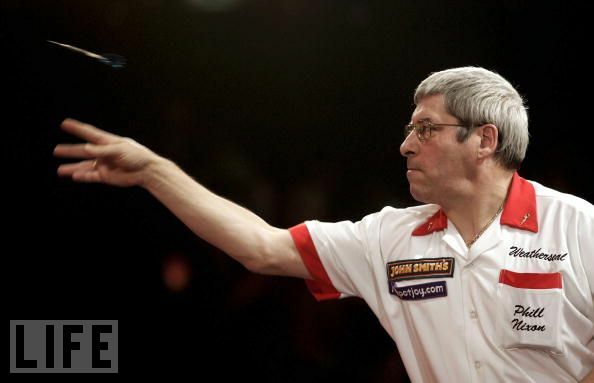 Perhaps the greatest idol on this list, Phil Nixon’s claim to fame is reaching the 2007 BDO final at the age of 50 in only his first appearance at the championship, having tried in vain to qualify for the previous 20 years. Such was the unexpected nature of his performances, the beeb’s production team seemed unsure of his nickname, veering between ‘The Ferryhill Flyer’ in reference to his home town, and the more rudimentary ‘Nixy’, a handle only marginally better than Mervyn ‘The King’ King. The final itself was hilarious, with Nixy seemingly destined for a crushing defeat, only to launch an inspired comeback before Adams crept over the line. As the arrows flew, we heard how the journeyman Nixy was a dedicated house-husband to his two children, with six other Nixy offspring existing somewhere in these fair isles. From looking at the man with his bland facial expression and weedy physique, he appeared to be anything but a rampant stud, but, as he started clawing back the legs, I felt proud that my taxes went to supporting his darting dreams, and the hungry mouths of his spawn. Since that glorious day in 2007, Nixy has alas wallowed in the doldrums, failing to qualify for the past two world championships, no doubt spending his time rutting away in alleyways shortly after closing time. Come 2017, being the ten-year anniversary of the epic final, I hope to flick over to BBC1 to see the 60 year-old Nixy, father of twenty by that time, putting Wolfie to the sword to claim the most unlikeliest of victories since Lee McQueen won series 4 of The Apprentice. For those who missed out all those years ago, link to the closing part of the final. ‘The man they call…Nixy.’ A bellowed cry of ‘NIIIIIIIIIIIXY’ is surely enough to send any darts enthusiast into an ecstatic froth. The ultimate hero of all sport. A toss up between John ‘Pert’ Part and Ted ‘The C(o)unt’ Hankey. Perhaps Hankey (like The King) is too obvious a choice, being, as he has so often demonstrated himself to be, a bell-end. Plus, Part’s intelligent reading of the game and his customary declaration of ‘good derts’ for years provided welcome relief from Tony Green’s dirge-like observations of play (‘Yes, it’s there’) and the crowd (‘Yes, there they are’). Robbie ‘Kong’ Green a possible omission? Anyone whose most rousing quote is ‘Things are going well’ surely deserves a mention, but quite aside from that he possesses perhaps the greatest monicker in darts after Tony ‘The Silverback’ O’Shea. Thought about going silverback, undoubtedly the greatest handle in darts, but couldn’t bring myself to discard either Fordham or Part, who would be most likely for the chop. Nixy surely the most ridiculous idol. Enjoyed reading your colorful and amusing commentary. Good stuff. Cheers for the words, Donny. Always nice to get some positive feedback! I try to post every month or more regularly, all being good, so try and come back sometime. Will have a read of your stuff.